I’ve always been obsessed with finding the fastest, easiest, or most elegant way of doing something, so many of my favorite Mac (and iOS) apps are simple, inexpensive utilities that help me do one thing better, faster, or more elegantly. I added a dynamic duo of such utilities to my Mac productivity arsenal earlier this year; today I wouldn’t want to use my Mac without them. Moom is a $9.99 app that manages windows on your Mac. I mostly use it to memorize the on-screen placement of windows from multiple apps so I can instantly restore my favorite screen layouts with a single keystroke. I used to spend time every day rearranging the windows on my screen until they were just so. Today, after I get the windows on my screen(s) to be “just so,” I ask Moom to memorize the layout so I can recall it whenever I like with a single keystroke. 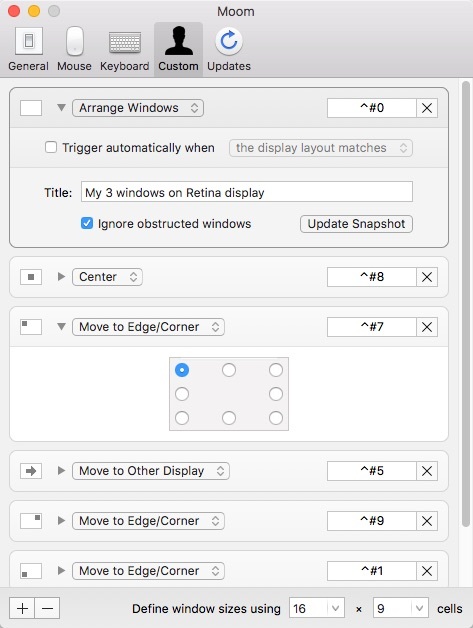 I have a 27-inch display connected to my MacBook Pro that I use as my main monitor, using the MBP's built-in 15-inch Retina display as a second display. I like to keep three windows open on that screen at all times—Activity Monitor, iTunes, and ZoneBox (my pomodoro timer/manager), and I like to see them in the same location on the smaller screen at all times. Sadly, no version of macOS so far has managed to convince windows to open in the same place on the same screen every time. Left to its own devices, macOS usually opened those windows somewhere on the larger screen. I press Control+0 and the windows on the smaller screen are instantly arranged exactly the way I like them! I have two displays, so another feature I use all the time relocates the active window from one display to the other with a keystroke (Control + 5). In the blink of an eye, the active window jumps from one screen to the other. Then, if I press Control+5 again, it will jump back to its original location. I also have shortcuts that instantly move the active window to one of the screen's corners (Control + 1, 3, 7, and 9). Just some of my Moom keyboard shortcuts. I also love being able to move and resize windows without touching the mouse (keyboard shortcut Control+`), yet another of Moom’s many excellent tricks. When I press Control + `, I can move or resize the active window from the keyboard, without touching the mouse! One satisfied user calls Moom the, “Best. App. Ever.” I’m not sure I’d go quite that far, but for ten bucks I consider it a bargain, and one that saves me time and effort almost every day. MenuMate=Your Menu Bar Wherever You Click! MenuMate is a $4.99 Mac app that puts the menu bar for the active app right under your cursor, wherever it may be on the screen. I believe keyboard shortcuts are far faster than reaching for the mouse and moving the cursor up to a menu. And, since many menu items don’t come with keyboard shortcuts, and there are many apps I don’t use often enough to know their keyboard, I find MenuMate indispensable in both situations. Once installed, it hangs out in the background waiting for you to summon it. When you do, via either a keyboard shortcut or programmable mouse button, the menu bar appears wherever you click. 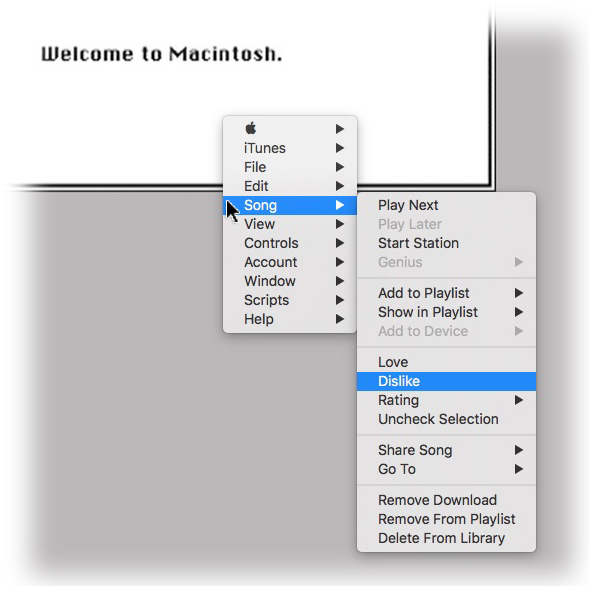 When I invoke MenuMate while using iTunes, its entire menu bar appears beneath the cursor. I mostly use mouse button #3 on my Logitech MX Master mouse —the one under the scroll wheel—to invoke MenuMate, and I find it incredibly handy. Having every item in every menu available wherever I click is an awesome thing.